“Prisoners” is the most exhausting movie I’ve seen this year. Not the checking-your-watch kind of exhausting, but the squirming-in-your-seat, heart-wrenching feeling that is rarely experienced without cinematic manipulation. When a movie this absorbing and – dare I use an overused adjective (but, it’s well-earned here) – harrowing, full of intense desperation and nerve-racking suspense, earns every fiber of my attention, then it’s safe to say it succeeds. 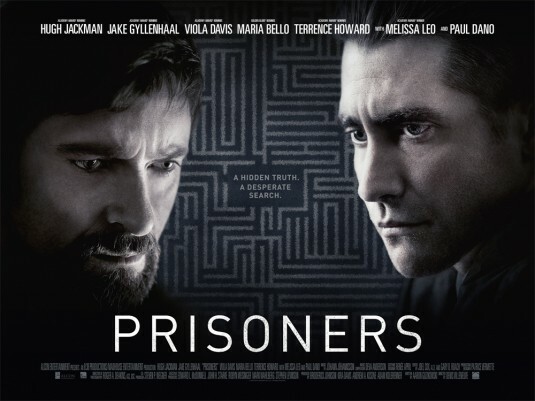 Indeed, “Prisoners” the first studio release and English-language debut from French-Canadian director Denis Villeneuve succeeds on multiple levels, resonating with viewers long after its abrupt cliffhanger ending, regardless of how they respond to the challenging subject matter. On an overcast afternoon in suburban Pennsylvania, Keller Dover (Hugh Jackman), his wife, Grace (Mario Bello) and their kids, teenager, Ralph (Dylan Minnette) and six year-old, Anna (Erin Gerasimovich) are spending Thanksgiving down the street with Franklin (Terrence Howard) and Nancy (Viola Davis) Birch and their kids, teenager Eliza (Zoe Borde) and six year-old, Joy (Kyla Drew Simmons). Everyone pairs off after the meal, the adults hang out around half-eaten pie and opened wine, leaving the teens to monitor the younger ones. These teens are kids as well though and everyone is jolted out of their food coma when they realize the two girls have gone missing. We’re the only ones aware that they went back to the Dover house to get something, but where they’ve gone to is as much a mystery to us as it is to their parents. They all spread out and search he neighborhood for the girls, but soon realize the authorities must be called. During this time, we meet seasoned Detective Loki (Jake Gyllenhaal), who receives a call about the girls while dining alone at a Chinese restaurant. Loki follows the only immediate lead, that of a ratty old RV that the girls were playing on as it was parked on the street near the Birch home. The vehicle is located that night at a gas station, where Loki and local cops apprehend the driver, Alex Jones (Paul Dano), a disheveled, mentally challenged young man. With his greasy hair and wide-eyes that hide behind large-framed eyeglasses, Alex fits the stereotype of a creepy child molester. But Loki’s interrogation proves frustrating, providing zero results, knowing full well that the simpleton couldn’t have orchestrated the kidnapping, not on his own at least. Without any evidence to hold him, Alex is released into the hands of his creepy aunt (Melissa Leo), which infuriates Keller. As Loki pursues other leads, like following up with known pedophiles in the area and finding a decayed corpse in the church basement of a drunken priest, Keller takes matters into his own hands by kidnapping and torturing Alex. Determined that Alex knows something about his daughter, Keller keeps him secured an abandoned building he still owns, while his grieving wife is knocked out on meds. Only Franklin and Nancy know about Keller’s homemade interrogation techniques and, as unsettling as it is, allow him this method, knowing who Keller is and also that there could be a possibility that Alex discloses some clue as to their whereabouts. Meanwhile, Loki remains dogged yet continues to run dry on clues. With the days adding up to almost a full week, all involved are reminded how the passing of time can turn a hopeful search and rescue into a devastating recovery. Although the propelling force behind “Prisoners” is finding two girls that have seemingly vanished, the main focus is on the two male leads played excellently by Jackman and Gyllenhaal. This is some of their best work to date. Not only are they perfectly cast here, but there are interesting layers to the characters that make them all the more interesting to see portrayed by these actors. If you thought you’ve seen Jackman in berzerker mode as Wolverine, seeing him as an enraged father turning to some dark places is more unsettling than of his work as the tortured mutant. In a deliberate irony, Keller is written as the ultimate protector, using the mantra “be prepared”, the Alpha Male has stockpiled his basement with emergency preparedness equipment, weapons and tools, fully prepared to ensure the safety of his family. But how can you prepare for something like this? Something that every parent fears and knows about. We’ve heard it before – keep your eyes on your child at all times – but we’re human and often have our guard down in family settings. As Keller beats Alex senseless, you’re not necessarily rooting for him but you understand hum, knowing full well this possibly clueless man-child may be the only connection to seeing your daughter again. It is indicated that Keller is religious man (and that he likes Springsteen), making what he goes through and does both a test and struggle of his faith. Jackman never overacts here, although another actor could and the audience might even roll with it considering the emotions involved, but since he conveys such intensity here, he comes off as unpredictable and mesmerizing. It may even earn him another Best Actor Oscar nom. If anything, his performance will certainly elicit a specific response from viewers who are fathers, as much as the movie does for parents. 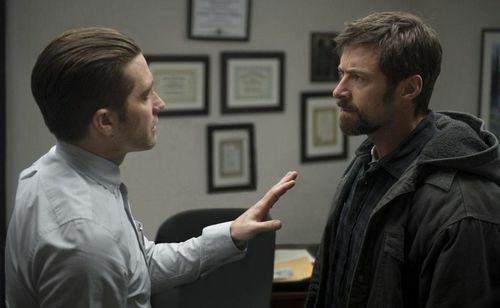 There are times, when Jackman and Gyllenhaal are together, that I anticipated Keller would let loose and throttle Gyllenhaal’s Loki, but the detective never seemed rattled by the furious father. Which is to say that Gyllenhall/Loki stands up well next to the strong presence of Jackman/Keller. Loki is a curious character. He almost comes across as brooding, but Gyllenhaal slowly allows certain nuances to show (a facial tick here, a fit of rage there), making Loki as interesting to watch as Keller. Known for closing all his cases, Loki, with his buttoned up oxfords and slicked back hair, seems to be hiding his own dark past (tattoos as well) and becomes almost as unraveled as Keller by the movie’s end, he’s definitely as invested and more level-headed than Keller. I enjoyed studying Loki. It was almost as if I was trying to figure out the character. What’s his story? What’s he about? Will he make mistakes? Hint: Yes, he does, which makes him all the more intriguing to watch. In particular, there are a couple of sequences involving his pursuit of another young man (played by Chicago actor, David Dastmalchian – he was the guy Harvey Dent interrogated in “The Dark Knight”), who’s about Alex’s age and kind of resembles him, that left me questioning Loki’s procedural technique. What transpired played for the sake of drama and heightened suspense, but if you stopped to question Loki’s behavior, one might second guess it (especially in the movie’s final moments). The rest of the actors offer solid supporting work and it would seem as if they’re getting sidelined, but with a cast this large and so many characters to manage, the movie has to focus in on some more than others. As much as the acting draws us in, the star of the movie is veteran cinematographer Roger Deakins (“No Country for Old Men” & “Skyfall”), who delivers some of his most effective work to date. His pristine work is always beautiful, but his use of earth tones and gray or rainy skies accentuates the building feelings of grief and dread. I can list off a handful of sequences that standout, because of the use of either a flashlight or silhouettes, that enhances the mood and tone of the movie. The haunting soundtrack by composer Jóhann Jóhannsson resonates as well. It also helps that director Villeneuve has another veteran, editor Joel Cox (who’s edited almost all of Eastwood’ films, including “Mystic River”, which this movie has many similarities to), working with him. For his first notable feature since the Oscar-nominated “Incendies”, Villeneuve has clearly surrounded himself with some very talented filmmakers. The screenplay by Aaron Guzikowski (“Contraband”) has its share of legitimate twists and especially emphasizes the tumultuous arc of Keller from survivalist to punisher to – well, that would be giving away too much. Both Guzikowski and Villeneuve waste no time getting to the disappearance of the girls and understandably has very little time for humor. But on that note, I found the audible reaction of chuckles and laughs at the screening I attended, quite alarming and baffling. 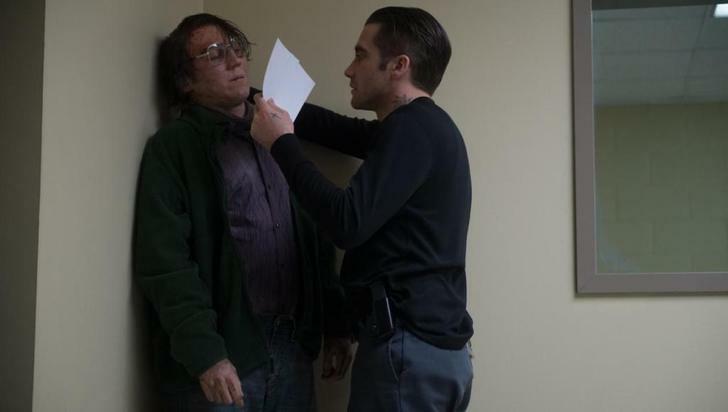 I don’t pretend to understand people and I don’t think you have to be a parent to get worked up watching this film, but there is no reason whatsoever to laugh out loud in “Prisoners”. Hopefully, Villeneuve and crew won’t have to experience such an audience. 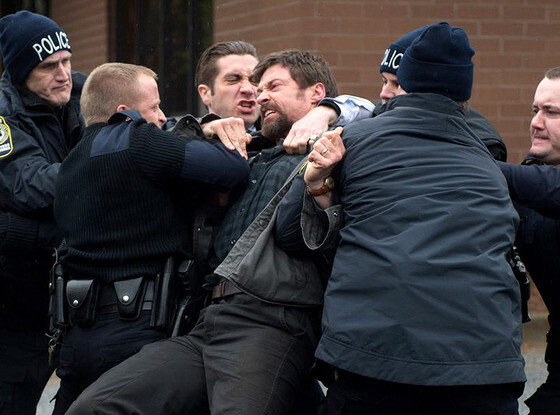 As much as “Prisoners” is a challenging movie to watch, I find myself wanting to revisit it. Not because of the shocking violence or legitimate suspense and emotional ups and downs, but to follow the story a little more closer, knowing the outcome. Another reason would be to spend more time with Keller Dover and Detective Loki, who are surprisingly two of the most captivating and interesting characters I’ve seen portrayed on-screen all year. Surprisingly, I’m willing to wind up on the edge of my seat to take it all in again. 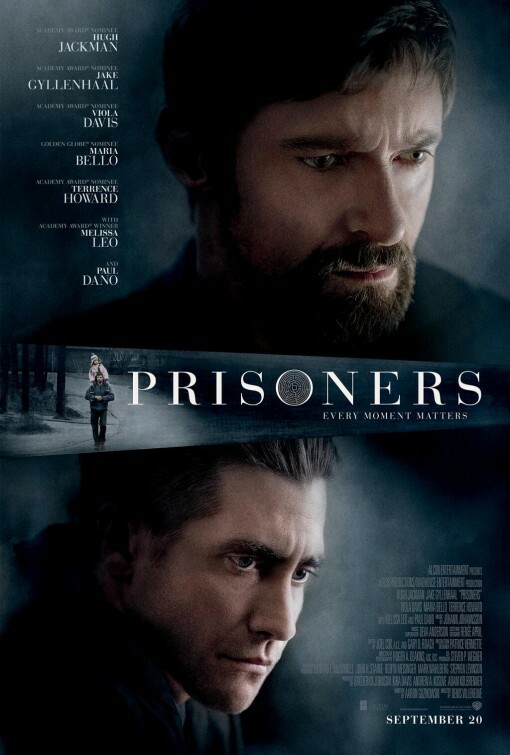 Balancing several themes very well, “Prisoners” offers fine acting and superb directing. You may not think you can watch it (and some will not be able to), but those who stick around will not be disappointed.